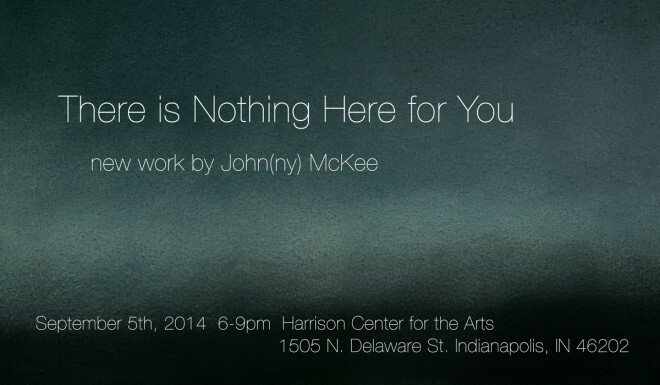 I have known John McKee for several years now & currently share studio space with him at the Harrison Center for the Arts. We moved into the studio together at the same time back in February. At that time there was this storage closet with all sorts of built in shelves that John was intrigued by. One day I came in and most of the shelves were mysteriously gone & John informed me that he wanted to use that space for creating. Knowing John, I was not at all surprised he wanted that space & several months later he has transformed it into one of the most unique creative spaces in our building. John is a minimalist painter and I have had the opportunity to see first hand how he created this new body of work for his September 2014 Solo Exhibit in the main gallery at the Harrison Center. At this point I am obviously a little biased but this group of paintings is very strong and several of them I believe to be some of Johnny's strongest work to date. If you live in the Indianapolis area, I encourage you to come check out his show this September First Friday at the Harrison Center. I will be here too with my studio door open.